GBA Sonic Advance 2 (USA) "Knuckles" in 20:32.08 by Dashjump. Disappointed with movies in which characters move just too slowly? Look no further! 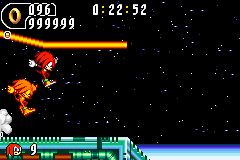 In this high-speed run, Dashjump demonstrates that even Knuckles can prove himself to be a very swift character. No Chaos Emeralds are collected in this movie, but it demonstrates almost every single move that Knuckles is capable of. If this is still too slow for you, we also have a TAS as Sonic. Note: In order for Knuckles to be available, starting from a reset is needed. This is normally not allowed; refer to the rules to see why.